Thank You!!!! from LET'S GET THIS FOUNDATION on Vimeo. Donnie to be in new movie - "The Zookeeper"
Donnie tweeted that he is going to be in a new movie called “The Zookeeper” with Kevin James and Rosario Dawson. Donnie Wahlberg has joined the cast of MGM’s laffer “The Zookeeper” alongside Kevin James and Rosario Dawson.Story centers around a zookeeper who decides to quit his job to find love, but the animals in his charge break their code of silence to teach him how to pursue the woman of his dreams. Frank Coraci is directing from the screenplay by James, Jay Scherick, David Ronn, Rock Reuben and Nick Bakay. Wahlberg most recently appeared in “Righteous Kill” with Robert De Niro and Al Pacino. Donnie will be making an appearance at the Jimmy Marsh "Keys to the City" Listening Party in New York City on August 6th, 2009. Danny’s End of Tour Blog! First off I want to thank everyone for the past year and a half. What a ride!! It has gone beyond anything I ever dreamed would happen. My kids got to see their Dad on stage, Wow!! !, simply unbelievable. Walking off stage and having my youngest daughter say “It’s so cool you’re my Dad” says everything. I also want to thank everyone for their tireless work with NKOTB’s fight against breast cancer. This year will mark 10 years since my mother past away. For me it’s a celebrating and a tribute to the woman she was and the angel she is shining down on us. I will continue this fight moving forward with the Komen Foundation. Thank you to Lynn Hughes, Carrie Glasscock, Jared Paul, Dave Brown, Janelle Lopez, Jared Siegel, Gary, Ute, and Allen at Bravado, and all of the Team Betty’s out there. I am forever grateful. Please remember this is only the beginning of our newest journey together. We will be doing many things in the near future. You are the sixth member and always will be. The one constant force through everything has been your dedication. 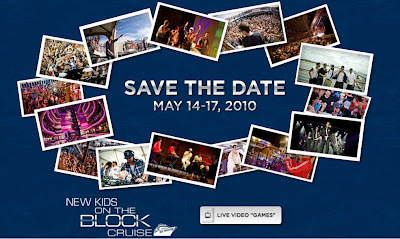 NKOTB.com has posted some updated info about the 2010 cruise! "All new NKOTB Experience with all band members"
Photos from Mall of America? As most all of you know, I have been blessed to have my family come along for this amazing journey. I would not have been able to miss my son at this special time in his life- his first steps, his first words and on and on. My wife was a Rock Star through it all. It is no joke raising a little baby on the road, but she handle it with style and grace. In the end it was all worth it. We felt there was no substitution for being together. And Griffin loved every minute- from helping the caterers to idolizing the Jabbawockeez. What amazing memories we will have forever to look back on. Family is the great chill pill on the road, the great equalizer, the humanizer. It was such a blessing to see the other guys with their kids. Danny’s girl were so sweet and would not let you walk by them without giving you a hug- even if they saw you, literally, 20 seconds earlier. Donnie’s son Elijah became a kind of life coach in our dressing room before the show- asking honest disarming questions with his dad’s charm. After all he got Jon Knight to sing Step 5- the Holy Grail of pop music. After Jon sang Step 5 one night on the summer tour, Elijah was ready to try it himself. A touching scene when Jon and Jordan and Elijah went over to the “warm up” keyboard just before show time to practice singing “Don’t you know the time has arrived! ?” I caught it all out of the corner of my eye and could feel the easy love of the whole thing. Kids break you down to your purest simplest way. And we all naturally reached out to them when they were out on the road. It is now common knowledge that Elijah nailed Step 5 and is now a seasoned pro with the mic. The apple sho nuf doesn’t fall far from the tree. Jordan said on the cruise that he would want his son to play him in a movie. Wise choice- Dante is as cool as his dad and a natural on the piano. (We got a little taste of his skills in the dressing room when we were in New England). It still isn’t time to write the history of this group. There’s too much love in the tank and we got places to go and people to meet. Where, how, and when, we will eventually know. Whatever it is, we will be held together by the fabric weaved together by our parents years and years ago. A quilt that grows and grows- so dazzling, so spectacular, the likes of which the world has never scene. Here is an interview with Donnie from News4U (I think it was originally for radio station Hot957)... Also click here to read about the interviewer's experience interviewing Donnie. "Houston we have lift off!!!!! I found a spot!!!!! HUSH nightclub ! 15625 Katy Freeway. West Houston. We gonna tear it down tonight!!!!" Here are a couple videos from youtube from the Remember Betty Party last night. Jonathan even sings! 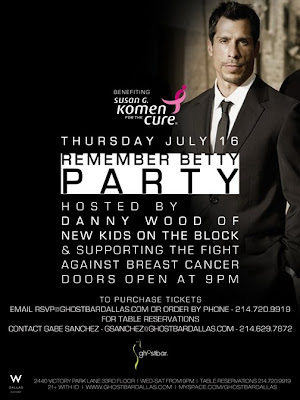 There is a Donnie Wahlberg After Party at the Ghostbar Dallas tonight. Click here to buy tickets. NKOTB.com has posted some FAQ's regarding the webcast. Also, Jordan will be picking one fan from all who order the webcast to fly from anywhere in the world and hang out with him and "the boys" (not sure if by "boys" he means the other New Kids or his two sons... Anyway, you can get more details on his Twitter page). He'll announce (or maybe even sing it) at the Dallas concert. Thanks to Jennifer for the update. Untitled from LET'S GET THIS FOUNDATION on Vimeo. There's going to be another new kid on the block: Joey McIntyre tells PEOPLE that his wife Barrett is expecting their second child – a boy – in December. "I still can't get over it," says the singer, 36, who also has 20-month-old son Griffin. "We feel so blessed." So far baby no. 2 has already managed to throw his parents for a loop. "My wife actually took the [pregnancy] test but she thought it was negative," says McIntyre. "She came out and gave me this look like, 'No.' Then she showed me the test and I said 'It's positive! What the hell?'" Then when the proud parents, who were convinced they were having a girl, found out they were adding another boy to the brood. "We were shocked," says McIntyre, who had his daughter's name picked out. But they're hardly disappointed. "It's going to be a trip to have a couple of boys around." Griffin is more than ready for his new brother, says McIntyre, who grew up the youngest of nine kids. Along with constantly kissing his mommy's belly, "We say to him all the time, 'Do you want us to bring home a baby?'" Griffin's response? "Please!" The toddler has also inspired Daddy to start a book drive through the Let's Get This Foundation. While on the road, McIntyre and the rest of the New Kids have collected thousands of new children's books and distributed them to children in need in various cities. "My wife is an avid reader and from the get-go she sat down with him and read with him. You see the importance of that," says McIntyre, who also reads to Griffin some of his favorites like Good Night, Gorilla. "Then I found out there's a lack of age-appropriate books for kids, I saw a huge void and I knew our fans could step up." McIntyre hopes to reach 25,000 children by the time the guys wrap up their tour on July 18. But the big question remains: Will his family grow to include nine kids? "I think we have a deal to keep going until we have a girl," says McIntyre with a laugh. "That's what my wife says." VH1 has a new show called "The Great Debate". In "Hour 5" they have a debate about who is the better boy band: New Kids on the Block or NSync. It airs at 7PM (EST) tonight on VH1. CLick here for additional air times. Thanks to Ggirl247 for the update. “Oh Baby” from "Step by Step” plays when an update is received! Go to Donnie's Twitter if you want to particiate in his latest project. Thursday, July 16 - Doors open at 9 p.m. The Griffster says "Sure" we can get to 25,000 books! from LET'S GET THIS FOUNDATION on Vimeo.